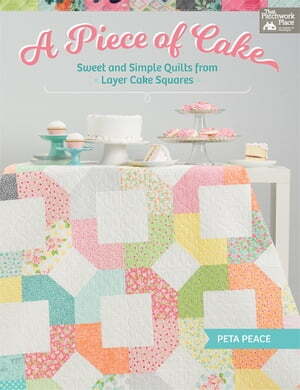 Collins Booksellers - A Piece of Cake by Peta Peace, 9781604688849. Buy this book online. Mix simple piecing with 10-inch squares plus your favorite background fabrics and you've got a quilt you'll be proud of. Transform your Layer Cake collection into intricate-looking designs that are a breeze to stitch--Peta Peace's tips will help you start and finish like a pro. You'll love the cheerful colors and innovative designs in these 14 all-new patterns.